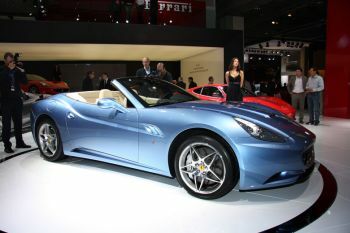 The Ferrari California finally made its official debut at the Paris Show yesterday after a series of special previews on the web and during two dedicated events staged in Maranello and Los Angeles at which it received an enthusiastic reception. The Ferrari California finally made its official debut at the Paris Show yesterday after a series of special previews on the web and during two dedicated events staged in Maranello and Los Angeles at which it received an enthusiastic reception. The Ferrari California is an exceptionally innovative car whose philosophy takes its inspiration from the spirit and emotions of one of the great Ferraris of the past, the 1957 250 California, a superbly elegant open top car designed for the track, which has, over the years, come to symbolise not only superior sportiness and performance but also exclusivity, craftsmanship and faultless sophistication. This new car joins Ferrari's 8-cylinder range which is made up mostly of very high performance models. It also flanks the 12-cylinder flagship 612 Scaglietti in the Grand Tourer category. The Ferrari California is a car with the track in its DNA. It is enormously innovative and will more than fulfil the expectations of even its most discerning clients, offering breathtaking driving pleasure and fun behind the wheel as well as extreme versatility of use and in-car comfort. It is available exclusively as a convertible with retractable folding hard top in either a two-seater version with a traditional rear bench or in the 2+ version which sees the rear bench equipped with seating for one to two passengers. In line with Ferrari tradition, this model positively brims with innovative features. 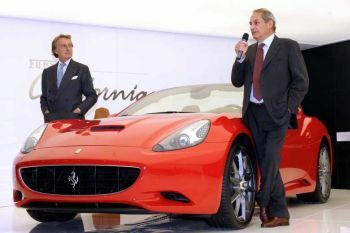 In addition to its retractable hard top and the aforementioned original 2+ concept, the new Prancing Horse car also offers: a new direct injection V8 engine, a 7-speed gearbox with steering wheel-mounted F1-style paddles coupled with a new dual clutch, a new suspension system (double wishbones at the front and multilink at the rear), the new evolved F1-Trac traction control system and Brembo brakes with CCM (carbon ceramic material) discs as standard (this latter feature is shared by the other models in the current range). In 2007, Ferrari's revenues (turnover) increased from the 1,447 million euro recorded in 2006 to 1,668 million euro, a jump of 1.3%. A total of 6,465 road cars were delivered to their owners, an increase of 14% on 2006. Our trading profit of 266 million euro represented a massive 45.4% increase on the previous year and brought our ROS (Return on Sales) up to 16% compared to 12.6% in 2006. 2008 is another year of growth for Ferrari. In the first half of the year, it took in revenues of 969 million euro, up 20.5% on the same period in 2007. Ferrari made a trading profit of 164 million euro (equal to 16.9% of revenues), a very impressive 62.4% improvement on the first six months of 2007. During the same period, it delivered a total of 3,506 cars to end-clients (+4.2%). Last June, President Luca di Montezemolo and CEO Amedeo Felisa presented the new phase of the Formula Uomo programme launched by Ferrari in 1997 to encompass such diverse areas as working environment, safety, environmental impact and energy saving, and services for employees and their families. In terms of working environments, Ferrari also recently celebrated the opening of its new Car Assembly Line building designed by French architect Jean Nouvel, winner of this year's highly prestigious Pritzker Architecture Prize, as well as the new company restaurant penned by architect Marco Visconti. With regard to the environment and energy-saving, Ferrari also presented two new projects: a photovoltaic system and a trigeneration plant which will reduce in the amount of electricity taken from the national grid each year by 25% and will also cut CO2 emissions by 35%. By the end of the year, Ferrari will also have begun work on building the new GES. Overall, since the building in 1997 of Renzo Piano's Wind Tunnel, more than 200 million euro has been invested in Formula Uomo. More than four million euro will also be invested in 2008 in structural and training activities aimed at improving safety in the workplace.